Sometime not too long ago, I was trying to get a functional G40 or even a G41. Unfortunately, very few eBay offers had them in some unconfirmed state that I probably wouldn't even dare to try buying them. Then paranoia got ahead of me and I bought this thing on impulse. This looks like your everyday G40/G41 but with the left heat ventilation port blocked by some plastic cover, along with the parallel and VGA port painted in some dull-grey color. 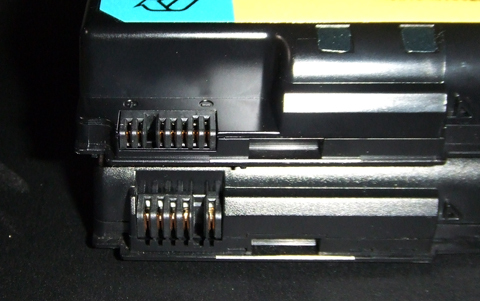 For some reason the battery's pin-outs as compared to the G40/G41's looks different too (G50 on the top, G40/G41 on the bottom), and it uses the 20V adapters like an equivalent T60/R60/X60/Z60 would use. Other than that it looks exactly the same as a G40/G41 would be, what a weird machine. Here is the G50's image, sad to say it comes with a Celeron M instead of a Core Duo. Ah well, I'd like to hear your opinions and thoughts about this particular ThinkPad. 26 June 2018 UPDATE: The G50 will not accept any MiniPCIE wireless card, unless it is a Lenovo-branded Atheros AR5006EX or a Lenovo-branded Intel PRO/Wireless 3945ABG. The no-1802 utility does not work on the G50's BIOS too, so a modified BIOS will be required to use a different MiniPCIE card. The G50 does not have a 2nd connector for the secondary fan found on the previous G40/G41 models, that means the secondary fan on some of the G40/G41 heatsinks will not function. G40/G41 keyboards will fit in the G50 with no problem. If anyone is interested in a picture with the G40/G41 US keyboard installed in my G50, please send me a personal message or ask by posting in this topic. Worst of all, the G50's BIOS does not accept a Core 2 Duo T7600 or any Core 2 Duo processor (Merom-derived). The fastest available for the G50 is the Core Duo T2700, or any Core Duo processor (Yonah-derived). Last edited by Screamer on Tue Jun 26, 2018 6:14 am, edited 2 times in total. Re: Obtained a G50, what is this thing? LOL, you found a rare gem without realizing it. The G50 is the Japan-only update to the G series, with the hardware equivalent to the *60 series. You should be able to update the CPU to any Core Duo, and if BIOS supports it, then even Core 2 Duo. Congrats on your nice purchase! Wow. Congrats. I do own a G41 (and owned two - if I've seen a post in the marketplace that you are looking for one, it would probably already be in your hands), but am looking/hunting for G50. Just missed my time when they were available. Again - congratulations. This is something one could put on a shelf just to make joy to anothers' eyes. A rare gem? I thought it was some common budget machine that nobody wanted, I guess my dumb self is hitting me again? Darn, if only I had known sooner that you owned a G41. Thanks, but I would definitely not want to put it on a shelf and make it a display model. Doing that would have killed my insides after all I have spent on this G50. Well then I guess you must have paid some heavy money for this one Actually G41, especially nVidia units get more and more harder to find. I've seen last G41 w/nVidia sold for $350. It had a working battery and was a top-shaped unit, however. I can hunt for one in Poland if you like, they tend to pop time to time. You can drop me a PM. Woah, $350? Sorry, but I think I'll pass, that is some crazy amount to pay for a nVidia G41. I have a Toshiba Satellite P25 that has the same GeForce FX Go5200 in the G41, but with only 64MB of VRAM. That cost me $101 in total with the extra horsepower the P25 has with its full-blown desktop Northwood Pentium 4 HT at 3.4GHz, so I guess you could say I went for a budget nVidia G41 back then. I upgraded the CPU in my G40 from Celeron to a Pentium and performance improved significantly. So IMHO, that is a worthwhile upgrade. Unfortunately, I think you are RAM capped at 2GB. For Windows, the obsolete Win XP is about as high as you can install. Or Linux. But even with Linux you may be limited to a lite version or an older version that will run on that hardware. I do not know if a US keyboard is available for the G50, or if the G40/41 keyboard will fit. Well this is not entireley true. W7 installs and boots just fine. The thing is, nVidia has drivers for Vista that work well on W7 as well; and some time in the past I've been trying to make integrated gpu work on another system, and failed. Since nVidia chips were present in G41 and not G40, effectively running W7 is possible on the first one. However, it installs on both units. The G50 is a strange device, it was only sold in East Asia markets, but it looks like Lenovo made it to be a budget laptop. Most configurations I've saw from this website shows only Intel 950 graphics, so they got rid of the nVidia option from the G41. Possibly it could of been a good thing considering the BGA solders nVidia had. Still though, considering how the East Asia markets had many small ThinkPads, strange to see the G50 still being sold there and not here. I'll need to get one someday. I have a G40 that I almost maxed out. - Changed the CPU from a Celeron to a Pentium. - Maxed out the RAM at 2GB. Specs say max 1GB, but 2GB works. - Put a 125GB HD. Next step would be a SSD, but XP does not support SSD, you need a SSD with firmware to do "garbage collection." I think this is the 'trim' function in Win7. - But with only 2GB of RAM, that would be a handicap to anything above XP. The low amount of RAM would cause the OS to swap to disk more. - There are more and more software that are not supported or will NOT install or run on XP. So in the end, I decided that as much as I like the computer, it's days have past. And I am sad that I did not get as much use out of it as I had hopped to. As was mentioned, even some of the Linux variants now have minimum system requirements that are beyond the G40. Linux was the OS to use on old/obsolete computers . . . not any more. Like XP, you have to look for an OLD version of Linux that will run on the older hardware. So I stopped spending any more $$$ on a dead end. I had wanted a G41 and G50, but no more. It's not like XP won't benefit greatly from an SSD. It would not be operating at peak efficiency without garbage collection, but it's still typically way better than a mechanical drive in most workloads, plus, some manufacturers ship SSDs with accompanying utilities to trigger this garbage collection manually on unsupported OSes. Indeed all this is correct. You are talking about a machine that's a decade and a half old, and an OS that is even older. One cannot reasonably expect either to support modern computing adequately. With that said, I always believe in running contemporary operating systems on my computers; modern systems with modern OS, retro systems with old OS, and whatever is in between. Precisely. The Linux world wants to move forward and adopt new technology as much as the Windows world. At some point too much backwards compatibility starts dragging you down. Dead-end is one way to view it, but another way is just to see it as a hobby, and not set up unreasonable expectations. A retro system will not be able to serve as a complete substitute for a modern one, nor should it. East Asia? That would imply that it could have been sold in China, but I had never seen a G50 that was sold in China. Would it be better to say that it was only sold in Japan, like what dr_st mentioned? By the way, NVIDIA has never encountered any BGA solder-related problems for the G84/G86/G92. The problem actually lies with the underfill that they used for the assembly of the G84/G86/G92 chips. If I am not wrong, the underfill used was the Namics U8439-1, which has a low glass transition temperature (Tg) of 70C. By following the Tg rating, if the temperature ever hits 70C and above, it will lose its structural rigidity and become a soft/rubber-like material. This is extremely bad for the solder bumps that act as a secondary support for the die of the chip, since they will have to support the entire die's weight without the underfill's help. With the additional stress caused by the underfill's weak rigidity at 70C and above, the solder bumps will eventually fracture from the mentioned additional stress and from the continous thermal expansion and contraction. Now, when you account the fact that the G84/G86/G92 chips were used in laptops, it makes sense that most of them died from this phenomenon. From this, I can definitely confirm that it is no BGA solder problem like what the T4x/R5x's ATI graphics chip suffered from. This is a problem that came from inbetween the die and the substrate of the affected graphics chip. The T4x/R5x's problems came from the motherboard to the graphics chip, and that is of course the BGA solder problem. Do have a look at this image, it should give a good clue to what I am explaining on. If you are still interested in the G50, I could personally message you an auction that has a working G50. Although it is about to end soon, 23 hours left or so? You can always swap your G40's motherboard for a G50's motherboard, but it is very difficult to find a G50's motherboard. Considering that the G50 is capable of using Windows 7 without much of an issue, this should be your ideal (note: difficult) route. That is if you are seriously so adamant on installing Windows 7 for some reason, which I can understand. SATA drives are also available for use in the G50 too, I forgot to mention. Is anyone interested in a G50?